Suspension Seats are most popular for off-road drivers. Many people argue that if you are doing extreme off-road driving, a suspension seat is a must. The idea behind a Suspension Seat is to reduce the amount of G-force transferred to the body therefore preventing your back from absorbing all the shock. Corbeau Suspension Seats are designed with the highest-grade materials. Corbeau Suspension Seats feature a rugged, powder coated, tubular steel frame. Attached to the frame is a military grade suspension cord system overlaid by high-density foam that is shaped to provide the ultimate comfort. 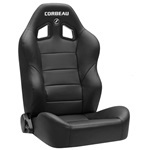 Corbeau Suspension Seats come equipped with harness slots for a 3, 4, or 5-point harness system. The containment level in Corbeau Suspension Seats reduce the amount of body shifting which will eliminate driver fatigue and enhance the overall driving experience. Corbeau Suspension Seats also come in a variety of colors and sizes almost guaranteeing that we have a Suspension Seat to meet your needs. This suspension seat is a direct bolt in to CJ and YJ Jeeps® and will bolt in any other vehicle with the Corbeau custom brackets. This seat features low sides for easy entry and exit. The Baja JP is only $229.00 per seat. Visit the Baja JP page to learn more about this Seat.